I think perhaps I might have left the mistaken impressions that (1) Brazil had not really addressed the issue before adopting that decree; (2) not much follow-up has occurred while awaiting the formal creation/organization of state-level committees; (3) states which have not yet adopted decrees formally installing such committees have done little on the issue. Brazil was one of the first countries to hold workshops and take steps to implement the UN Environment Programme’s (UNEP) Awareness and Preparedness for Emergencies at Local Level (APELL) process after UNEP launched it in 1988, including the creation of a coordinating group in Alagoas state (AL) and an emergency plan and training drills for Latin America’s largest chlorine production plant there. 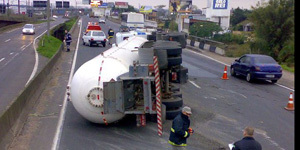 Brazil adopted regulations on the transport of dangerous goods by road as early as 1988, and regarding rail transport in 1990, supplemented by normative instructions issued in February 2004. The Brazilian Association of the Chemical Industry (ABIQUIM) adopted the Responsible Care (Atuação Responsável) program in 1992 and in 1998 made its six codes mandatory (in order to retain ABIQUIM membership), including those on transport and distribution and on dialogue with the community and emergency preparedness and response. [These codes have since been replaced by guidelines.] Industry also created training centers for chemical emergencies at the Camaçari (Bahia – BA) and Triunfo (Rio Grande do Sul – RS) petrochemical complexes. 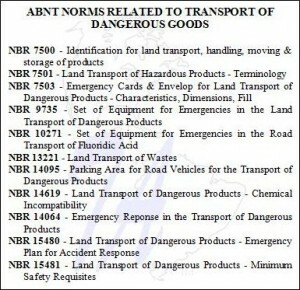 Beginning in the late 1990s the Brazilian Association of Technical Standards (ABNT) elaborated and adopted (and since updated) a series technical standards relevant to the transport of dangerous goods and chemical emergencies (see box), most of which have became mandatory, covering such subjects as emergency cards (TERS/TREMCARD) and emergency services. 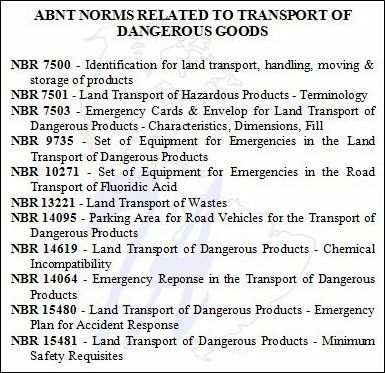 Brazil has long participated in the UN’s work on Recommendations on the Transport of Dangerous Goods (TDG or “Orange Book”) and has implemented and regularly updated them through measures issued by the National Agency on Land Transport (ANTT). It has also implemented the MERCOSUR instruments on the transport of dangerous goods, and has sought to reflect in its regulations the European Agreement Concerning the International Carriage of Dangerous Goods by Road (ADR), the Intergovernmental Organization for International Carriage by Rail’s (OTIF) Regulation concerning the International Carriage of Dangerous Goods by Rail (RID), even though it is not an official party to either agreement. In 2001 Brazil became one of two LAC nations (the other is Colombia) to ratify the International Labor Organization’s (ILO) 1993 Convention (#174) on Major Industrial Accidents (text in English, Spanish, Portuguese). Second, just because a state has not yet formed a formal P2R2 committee doesn’t necessarily mean that it has been inactive on the issue of preparing for, and responding to, accidents involving hazardous substances. As noted above, AL formed a coordinating group long ago, and BA and RS participated in planning for accidents linked to their petrochemical poles. Then there is São Paulo (SP), whose environment agency, CETESB, with the help of the Pan American Health Organization (PAHO), became the reference training center regarding preparedness and response to industrial accidents for not only Brazil, but also the rest of South America. Third, the federal government has not just been sitting around idle, waiting for the states to establish their committees. With help from the National Environment Fund (FNMA), the Environment Ministry (MMA) has been helping some states form state committees, train response teams and helping prepare maps some of high-risk zones. In fact, just ahead of the next meeting of the national P2R2 committee, MMA has just announced a schedule of further P2R2-related actions at the federal, state and local levels. The first action, scheduled for 16 April, will be a simulated leak of diesel fuel from a Transpetro pipeline that runs alongside the road in a populous section of the Federal District (DF, Brasilia and its satellite towns). The simulated accident will assess the responses of environment and health agencies, Civil Defense, the Fire Department and police. Soon thereafter national P2R2 program will hold a seminar in Belém, Pará (PA), on the water transport of dangerous goods in the Amazon Region. The meeting will discuss the transport of hazardous chemicals into waterways and navigable rivers of northern Brazil. According Mírian de Oliveira, MMA coordinator for environmental emergencies, accidents occurring in that region bring particularly serious impacts both to the environment and to the health of people living near the waterways. O Ministério do Meio Ambiente inicia em abril um calendário de eventos para preparar a sociedade e órgãos dos três níveis de governos – federal, estadual e municipal – para intervir de maneira conjunta em eventuais acidentes envolvendo produtos perigosos. O primeiro está marcado para o dia 16 de abril e ocorrerá às margens da Via Estrutural, em Brasília, onde está localizada a Cidade Estrutural, uma das mais populosas do Distrito Federal. Na data agendada, será feito um simulado de vazamento de óleo diesel de um duto da Transpetro, que passa às margens da via. A iniciativa busca capacitar e avaliar as ações de resposta de órgãos ambientais (Ibama e Ibram), de Defesa Civil e Corpo de Bombeiros, de saúde e de polícia no atendimento a emergências decorrentes de acidentes com produtos químicos perigosos. Logo em seguida, a coordenação da Comissão Nacional do Plano Nacional de Prevenção, Preparação e Resposta a Emergências Ambientais com Produtos Perigosos (P2R2) promoverá, em Belém (PA), o seminário sobre Transporte Aquaviário de Produtos Perigosos na Região da Amazônia Legal. O encontro vai discutir sobre o transporte de produtos químicos perigosos nas hidrovias e rios navegáveis da Região Norte. De acordo com Mírian de Oliveira, coordenadora de Emergências Ambientais do MMA, os acidentes que ocorrem naquela região trazem impactos gravíssimos tanto ao meio ambiente quanto à saúde das populações ribeirinhas que necessitam de um pronto atendimento e de ações de recuperação ambiental a fim de mitigar os efeitos danosos consequentes dos acidentes. Para debater sobre o restante dos eventos que comporão o calendário 2009 do Plano Nacional P2R2, a secretária de Mudanças Climáticas e Qualidade Ambiental, Suzana Kahn, abre nesta terça-feira (17), às 9h, no anexo da 505 Norte, um fórum de discussões com a participação da Comissão Nacional. Estarão presentes no debate representantes dos ministérios da Integração Nacional, Saúde, Minas e Energia, dos Transportes, da Justiça, do Desenvolvimento, Indústria e Comércio Exterior, do Trabalho e Emprego e cinco representantes (um por região) da Anamma e Abema, dois representantes da Confederação Nacional da Indústria (CNI) e um representante do fórum que reúne organizações não-governamentais e movimentos socais. O Plano P2R2, instituído por Decreto Presidencial em 2004, é coordenado pelo Ministério do Meio Ambiente. Além dos governos federal, estaduais e municipais, a comissão conta com representação da iniciativa privada e da sociedade civil. Além de supervisionar a execução do P2R2, a Comissão tem por objetivo formular estratégias, políticas e procedimentos relacionados a emergências ambientais. “O que se busca são resultados efetivos na melhoria da qualidade ambiental e, por meio delas, uma melhor qualidade de vida para a população”, explica Mírian Oliveira.